For the first time, Whitworth Theatre will stage its fall production at Spokane’s Bing Crosby Theater, at 901 W. Sprague Ave. Performances of “Honk! A Musical Tale of The Ugly Duckling” will take place Oct. 19 and 20 at 7:30 p.m., and Oct. 20 and 21 at 2 p.m. General admission is $9; admission for students and senior citizens (62 and up) is $7. Tickets may be purchased at 1-800-325-7328, at www.ticketswest.com, or at the door. 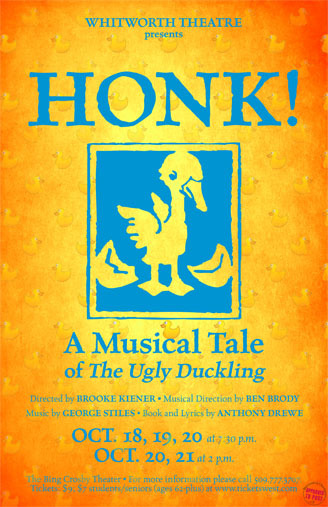 “Honk!” is a musical adaptation of the Hans Christian Andersen story The Ugly Duckling with a message of acceptance and appreciating differences. The show debuted at The Watermill Theatre in England in 1993. The West End production of “Honk!” opened in 1999; the following year it won the Olivier Award for Best Musical, an award presented annually by the Society of London Theatre in recognition of excellence in professional theatre. Through comic and endearing moments, “Honk!” is entertaining for all ages, says Brooke Kiener, an assistant professor of theatre at Whitworth and the play’s director. About 50 Whitworth students are part of the cast, crew and orchestra for “Honk!” The play’s musical director is Ben Brody, an associate professor of music at Whitworth, and the lighting director is John Hofland, former chair of the theatre department at Gonzaga University. Aaron Dyszelski, an assistant professor of theatre at Whitworth, designed the sets and the costumes for the production.